Kuljetus ja muutto O.Jylhä Oy has done moves in Middle Finland and from Jyväskylä to all over Finland over 50 years. To our move-services counts among other things rental of move-boxes, if needed protection and packaging of movables for transportation, storage of items and transportation of furnitures for recycling or to dumping ground. You can also book final-cleaning. According to agreement we can also do evaluation of the moving place eg in connection with company-moves, in which case we clarify the amount of goods/items and the circumstances of the move-place. To make our move-service work out the best possible way it is good to have as much information as possible beforehand. The easiest way to provide us this information is to fill out our move-quotation-form, to which we answer as soon as possible. Our movers are knowledgeable and responsible professionals. 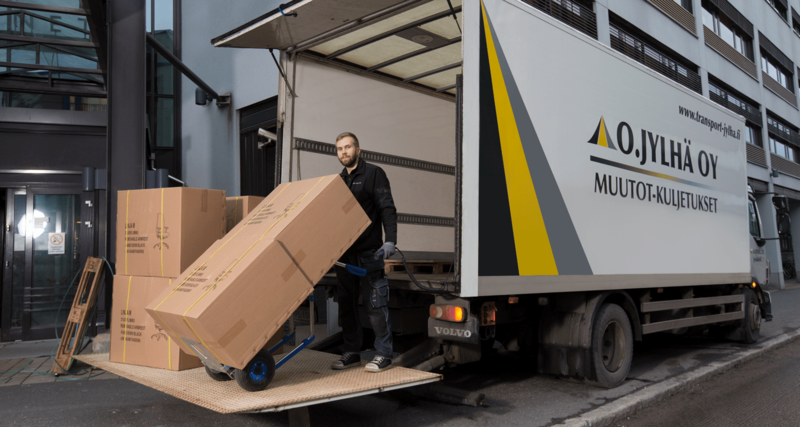 If however a damage is caused to our customers property during the move, the liability insurance of Kuljetus ja muutto O.Jylhä compensates for damages, which causes to customers property.Kuljetus ja muutto O. Jylhä has a road transport insurance according to the road transport law. This insurance replaces damages with 20 €/kg which are caused to customers real property during the move by Jylhäs staff. Muuton kustannukset vaihtelevat asunnon koon, irtaimiston määrän ja muutto-olosuhteiden mukaan. Muuttomatka asuntojen välillä, kerrosten lukumäärä, hissin koko yms. seikat vaikuttavat tarvittavien muuttomiesten määrään. Hinta-arvion saamiseksi muuttotarjouslomakkeeseen on hyvä täyttää kaikki mahdolliset tiedot. You can pay for the move by cash or card directly to the driver.